‘The Walking Dead’ Recap: “The Well” – Zombies, Tigers, and Carol Oh My! We’ve been on a long, strange road with The Walking Dead as viewers, haven’t we? Now of course, I haven’t been the reviewer for the series for the site this entire time, but I’ve been watching the show and reading the comics since I read a blurb in the now defunct “Wizard” magazine over a decade ago. Needless to say, we’ve seen our fair share of zombies, lost some limbs along the way, and have been following the adventures of Rick and company as they battle through this strange new world. To be fair though, this version of the zombie apocalypse still managed to have somewhat of a “real world” stance with elements introduced that you could see taking place if it actually happened. Michonne could exist, Daryl could be the guy next door you share a beer with, Rick could be the police officer who lets you off with a warning when you’re caught speeding. With this episode however, things may change as the world of the Kingdom was brought to bare. Keep in mind however, considering how “out there” this latest installment is, your mileage may vary. Last season, Carol had decided that the travails of her life in the Walking Dead were a bit too much to take and had sworn off murder entirely, which acted as something of a stark parallel to Morgan who began to see the benefit in it. Saved by mysterious armored men, the unlikely duo now find themselves in a town that is ruled as if it were straight out of King Arthur and the Knights of the Round Table. 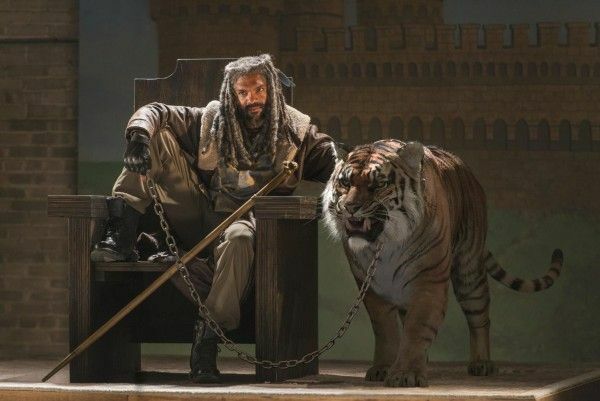 The “Kingdom’s” citizens run an organized establishment where everyone pulls their weight, led by the seemingly insane Ezekiel, who rules over the land believing himself to be their medieval king, along with his pet tiger, Shiva. 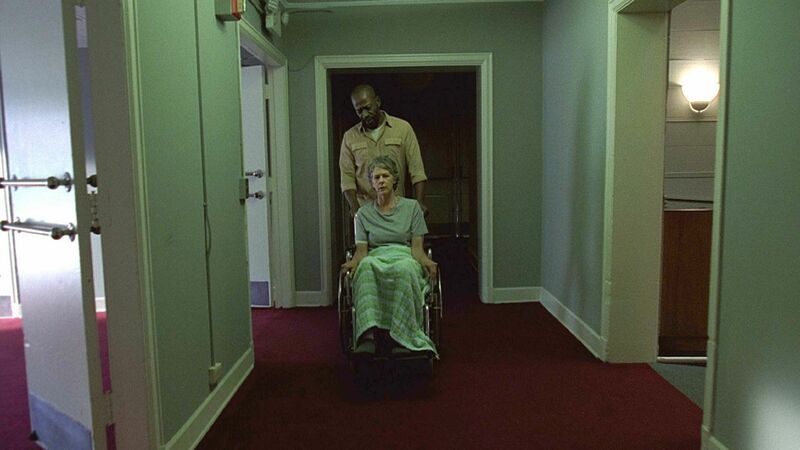 The scene where Carol is first introduced to Ezekiel and his lifestyle is worth the price of admission, bearing a striking resemblance, I’m sure, to the reactions of viewers nationwide as they watch “The Well.” Melissa McBride has been one of the strongest actors in the show to date, and alongside Lennie James’ Morgan, they manage to sell scenes both quiet and frantic. 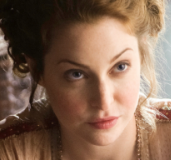 In the season premiere, we were given something of a mess that was also crushingly depressing. 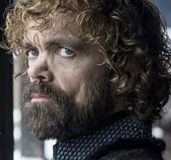 Now bear in mind that the first episode of season seven wasn’t lackluster because of its dark subject matter, but simply because of how it was structured with the episode almost being made for the advertisements that accompanied it. At the end of the day, this episode’s levity is more than welcome and you can get a sense that all the actors were genuinely having a grand old time delivering their lines. 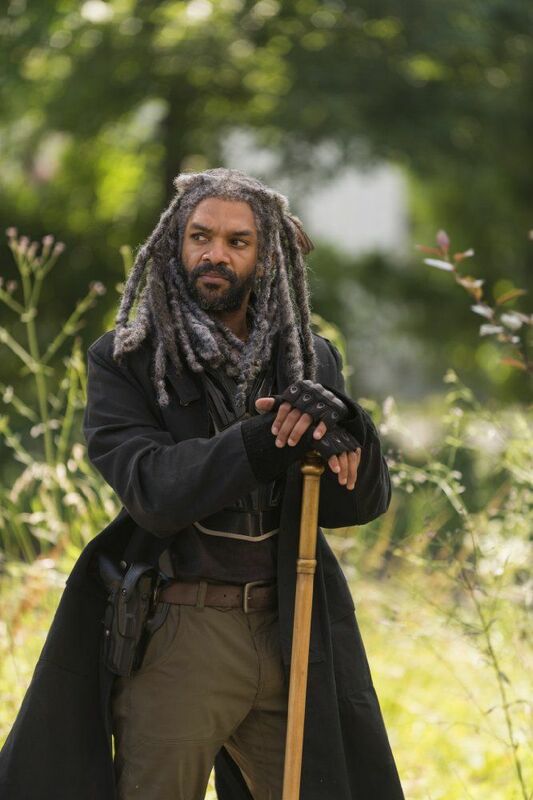 Khary Payton’s Ezekiel manages to run the gamut from the absurd to the emotional, bringing the character to life fully fleshed out while delivering some great sage advice along the way. 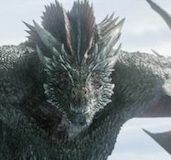 Ezekiel is surprisingly three-dimensional, which you would not expect from his initial splash onto the scene, and this is especially driven home later in the episode during his heart to heart with a potentially fleeing Carol. While the Kingdom itself isn’t necessarily as alluring as the character of Ezekiel, it manages to present a new aspect to the series in this “brave new world” that the show may have needed following the unrelenting doom and gloom. As for the events of the episode, we’re given a good amount of character development with Carol, painting a fake picture of who she really is in order to blend in with the citizen’s of Ezekiel’s town. 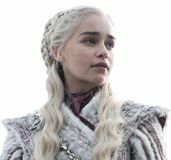 We’re presented with a number of light-hearted scenes of Carol stealing clothes, pilfering knives, and generally attempting to do her best to maintain her status as the series’ number one survivor. The hallucinations she experienced as well, seeing zombies as living, breathing people, was a nice nod to her current state of mind. 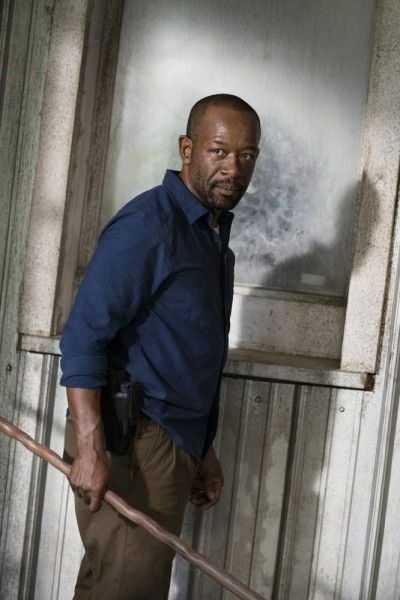 At the same time, Morgan is still struggling with his recent execution of one of the Saviors, speaking with Ezekiel candidly about the fact that perhaps sometimes a gun is needed where a bo staff won’t necessarily suffice. Honestly, Morgan and Carol were the best ones to introduce us to the Kingdom as their range and in-depth characterization really manage to hit home the ludicrousness of their new setting while also keeping things grounded. All however is not well in Denmark as the Kingdom has a deal with Negan’s crew, giving them provisions on a weekly basis in order to avert war. Ezekiel does his best to keep the peace, but unfortunately, Negan’s goons don’t share his temperament and start up a fight with one of his men during the offering. These scenes weren’t necessarily anything to write home about, but they once again give us a better idea of the Kingdom and the way Ezekiel runs it. The king of this strange town manages to be stalwart and human, not taking into account his seeming insanity as he boasts as if he were torn from the pages of a George R.R. Martin novel. It’s in one of the final scenes that we’re given an in-depth look at who Ezekiel really is, adding an entirely new level to the character. Attempting to stop Carol from slipping away from the Kingdom, the king manages to impede her path and tell her about who he really was: a full-time zoo keeper, part-time theatrical actor using his experience to create a legend to placate the fears of his people. Ezekiel’s backstory is an interesting one, with the “pill” of Shiva being his protector thanks to him saving her life managing to be easier to swallow thanks to Payton’s line delivery. 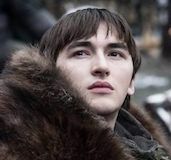 His monologue to Carol manages to sell not only his character, but the idea of the Kingdom, offering a new side of the series that will hopefully get more screen time as things move forward this season. To be honest, Rick, Negan, and Ezekiel all make for great, fun-to-watch leaders of what may be an upcoming three-way war and the show certainly benefits from that fact. “The Well” manages to play on many of the strengths of The Walking Dead, weaving together some good character work, fantastic zombie effects, and interesting premises that the premiere stumbled on along the way. If you can accept the trappings of the Kingdom and the eccentric Ezekiel, there’s a lot to like in this latest episode. – Shiva, the computer generated tiger, isn’t exactly Life of Pi but she’s serviceable and manages to not look tacky. – Kudos again the makeup artists and special effects team of the series for managing to present a ghastly zombie kill nearly every episode. The zombie’s face being slashed off managed to get a nice gasp from yours truly. – Jerry’s my new favorite character. – Morgan’s journey continues to be interesting though I can’t help but think Ben isn’t long for this world. 'Westworld' Recap: "Contrapasso" - Are We Old Friends?